The creator of the A-Z road maps is to be honoured with the unveiling of a Southwark Council Blue Plaque. 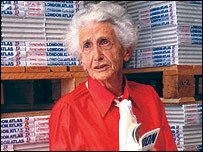 Phyllis Pearsall walked 3,000 miles to create the atlas of London, which first went on sale in 1936. She had the idea when she became lost while trying to find the homes of people she had been asked to paint. The plaque will be unveiled on Wednesday at 3 Court Lane Gardens, East Dulwich, south-east London, where the artist was born in 1906. After coming up with the idea shortly after her 29th birthday, Mrs Pearsall employed some freelance draughtsmen. 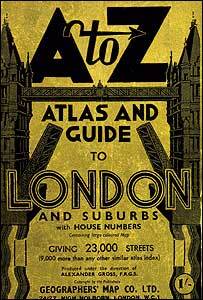 She then set about indexing all 23,000 London streets on foot, and despite scepticism and ridicule, her first A-Z London was on the bookshelves of WH Smith by 1936. The most recent maps available at the time were the 1919 Ordnance Survey maps. The A to Z company that Mrs Pearsall founded and supported until her death in 1996 is still going strong today, and employees from the company even meet annually to celebrate the birthday of their much-loved founder. John Frankel, managing director of Geographers' A to Z Map Company Ltd, said: "It's a fitting tribute to Mrs Pearsall that her name will be displayed in Dulwich in recognition of her contribution to mapping the streets of London. "The A-Z brand of mapping is now a market leader throughout the UK. Mrs Pearsall continues to be an inspiration to us all." She was awarded an MBE for her work. She died of cancer on 28 August 1996, a month before her 90th birthday. Southwark Council's blue plaques scheme was born in 2002 to give residents and visitors the chance to decide which local icons, past and present, they want to see remembered with a plaque.